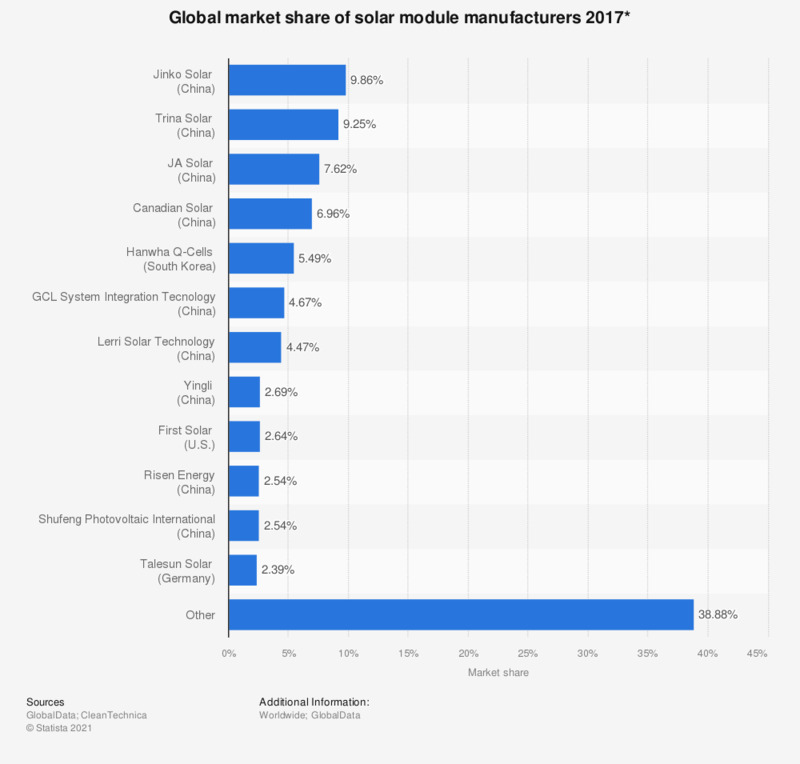 This statistic illustrates the global market share of solar photovoltaic (PV) module manufacturers in 2017, based on market share. That year, China's Trina Solar held the second largest market share with around 9.3 percent, based on revenues. The solar PV module market continues to be dominated by Asian companies: nine out of twelve companies in the list are based in China. A solar photovoltaic module typically consists of a set of solar cells. When exposed to light, these small electrical devices absorb the light and convert photons into electricity. Semiconductor materials such as silicon are the fundamental building blocks of a solar cell. Monocrystalline silicon and thin-film silicon technologies are the materials that are predominantly employed in solar cell manufacturing. In light of dwindling solar cell prices, many once successful manufacturers, such as Germany’s Q-Cells - which is now a subsidiary of the Hanwha Group -, have been squeezed out of the market. On the upside, this trend has helped making solar photovoltaic power become more affordable. Solar electricity is expected to be less consistently costly than power generated fossil fuels in the near future. The global solar power market is expected to reach 158.4 billion U.S. dollars, with China being the largest market for solar cells and modules. China was home to nine of the world’s leading solar module manufacturers in 2017. The Chinese manufacturers Yingli and Trina Solar are considered two of the world’s leading manufacturers in the field of solar photovoltaic modules. * Based on market share of shipments. Everything On "Solar photovoltaic industry" in One Document: Edited and Divided into Handy Chapters. Including Detailed References. Statistics on "Solar photovoltaic industry"